It’s 1:07 pm and I’m busily typing away on an article in our 6th story apartment. The window is open and I can hear the eclectic sounds of Mexico City below – horns blaring, the whistle of a camote cart, the relentless audio recording on repeat from the truck that picks up unwanted appliances. I feel the gentle rumble of the metro as it passes below and I don’t think twice about the slight sway of the building. I take a sip of coffee. A few seconds pass…I type a few more words. The rattle of the metal window frame catches my attention and I pause…I close my laptop, my music stops. My chair is shaking, the coffee in my favorite cup is swaying violently from side to side. They say when humans sense danger we have a flight or fight response – well my instinct was instantly kicked into overdrive. Before I had time to think, I’m racing down concrete stairs. I grip the banister as I am thrown from side-to-side like a rag doll. At one point I’m violently thrust forward down the stairs. I catch myself and find my footing. As I reach the bottom, abuelas in hair curlers are trying to hold their small dogs while gripping the sides of the stairs. Young children are being hurried down the right side of the stairwell. I’m flying. I burst out onto the street. Calzada de Tlalpan, one of the largest streets in Mexico City, is at a dead stop. Crowds of people are gathered in the middle of the road between cars and trucks with horrified looks as they stare back at the buildings they had just evacuated. The buildings dance together in unison swaying side to side. A brand new building with a prominent SE VENDE (for sale) sign cracks and crumbles as windows shatter. Gasps and screams fill the air. Por Dios! Por Dios! women are yelling and crying all around me. Men stand in shock. My heart is about to jump out of my chest and the reality of what is happening sets in. I feed off of the energy from the crowd and I too, begin to sob. The rumbling stops and for the first time ever, the city is eerily quiet. Everyone begins to take out their cell phones and the calling frenzy begins. Cell phone towers are overwhelmed by 25 million calls going out at the same time. My mind is racing as I think about my husband who left an hour ago to run errands. Where did he tell me he was going again? Was he in a building? Was he on the metro? The panic begins to set in. In an instant, the crowd around me begin to scream, Se va a caer! Se va a caer! It’s going to fall! It’s going to fall!” I’m running now, following the mob away from the buildings, trying to get a call to go out on my cell phone. The crowd stops running and the “for sale” building stands tall and strong with a large crack down it’s facade. I begin to sob uncontrollably. An elderly woman gently pats my shoulder. Where is my husband? Fifteen minutes pass and I have resolved to sit on the sidewalk feeling hopeless – my mind goes into overdrive as it runs through various “what-if” scenarios. Suddenly, like a scene out of a movie, the crowd parts and there’s Ray, running up the street. I wrap my arms around him in relief and soak his shoulder with my tears. He explains that, when the shaking started, he rushed to the the middle of an intersection along with an elderly man. After the wrath of Mother Nature had passed the man shook Ray’s hand and parted ways, Hoy, Dios nos dio otra oportunidad. Today God gave us another chance. Ray and I sat on the sidewalk trying to get a phone call out to loved ones waiting to hear when, or if, we could get back into our apartment building. We had no idea of the extent of the damage to the city. All we could do was wait. 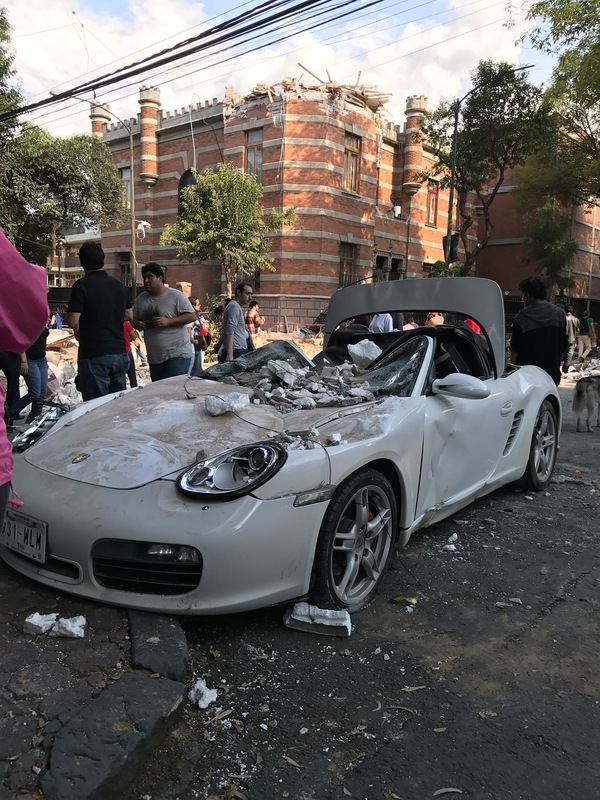 By the next morning we learned that a 7.1 earthquake had hit about 75 miles Southeast of Mexico City in the state of Puebla. 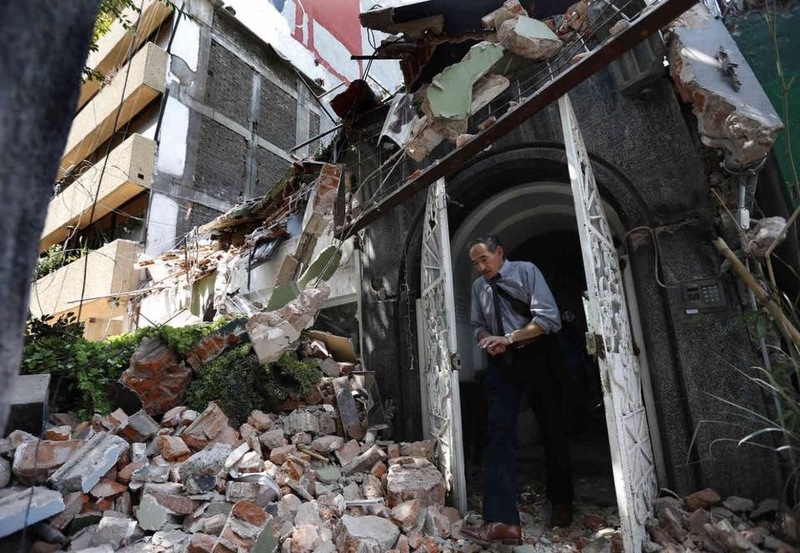 Eerily, September 19th, 2017 marked 32 years to the day of the deadly 8.4 magnitude earthquake that devastated Mexico City in 1985, killing thousands. Just that morning there had been a city-wide earthquake drill for schools to commemorate that fateful day. Little did they know, everyone would be doing a real-life evacuation just 3 hours later. You may be asking, but if Mexico City doesn’t sit on a fault line, what makes it so susceptible to such devastating earthquakes? Well, it has to do with soil. 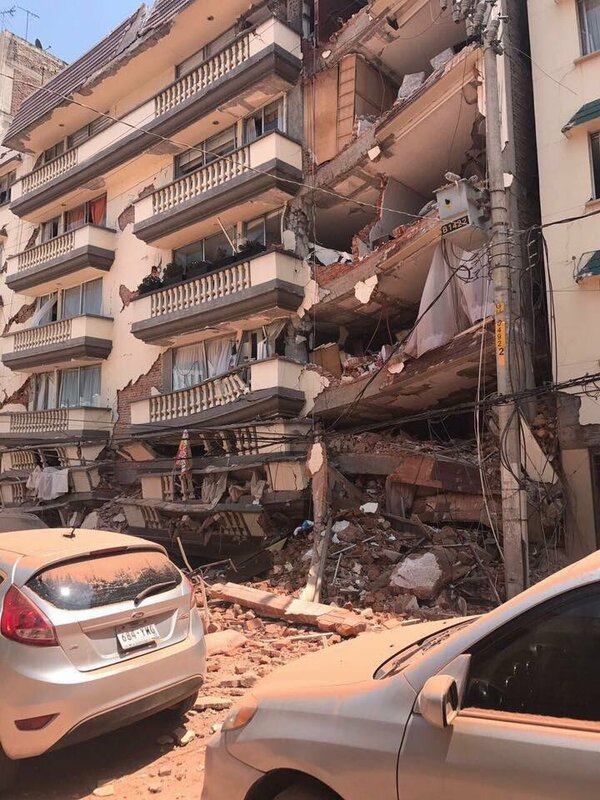 You see, Mexico City was built on top of a lake and thus buildings are balancing on very soft, wet ground which, when moved by an earthquake, can cause extreme damage. 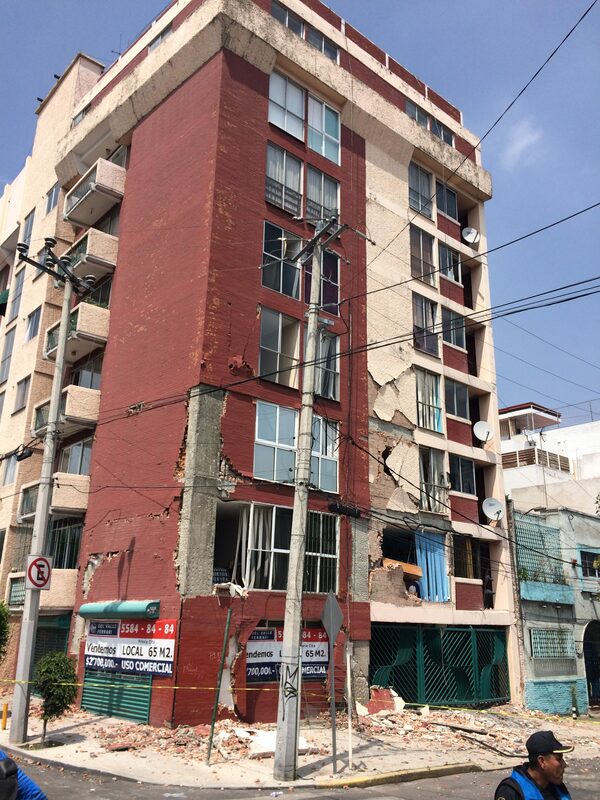 Further, Mexico City is so densely populated that there are far more casualties as 5, 8, 10 story apartment and office buildings begin to tumble. Directly after the quake, the city went into panic mode. Communications were completely down, parents were trying to get to their children’s schools, workers weren’t sure if it was safe to return to their office buildings, all public transportation was slowed or completely halted. With no other options, people just started flooding the streets and walking home. For a people who have little faith in their government, the citizens of Mexico City began to organize. Truck loads of volunteers with hard hats and shovels swarmed fallen buildings and worked into the night sifting through the rubble, piece by piece. By Wednesday morning relief efforts were in full swing. All 25 million inhabitants seemed to have flooded the streets. Wednesday morning Ray and I hop on our bikes and head to Parque Mexico, a central meeting point for donations and volunteers. The city is in complete chaos. Our hearts sink into our chests as we bike through the high-end, bohemian neighborhood of La Roma. Large, visible cracks line the streets and sidewalks. Iconic buildings suffer from broken windows and structural damage. People swarm around two, fallen 12-story apartments and we watch as human chains of volunteers pass rubble to each other. Strangers, side-by-side, some with gloves, some with bare hands work tirelessly. They know time is of the essence. 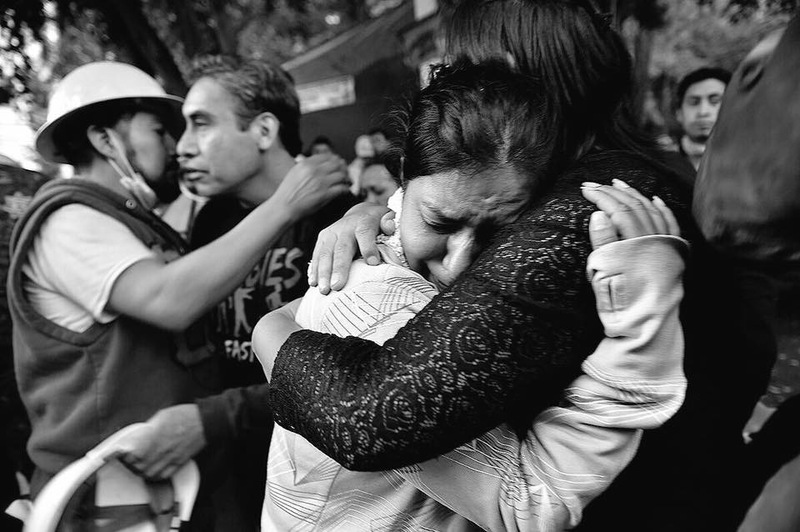 The solidarity of the Mexican people is unwavering. Trucks full of tamales, sandwiches, coffee and water, are parked handing out provisions to exhausted volunteers that had stayed overnight to sift through the debris. Families have created makeshift shelters on the sidewalk, where they had slept the night before, to scared to go back into their apartments, fearing aftershocks. Water spews from an apartment building and I can see the inside of someone’s home. A shower. A toilet. A dining room table and chairs. 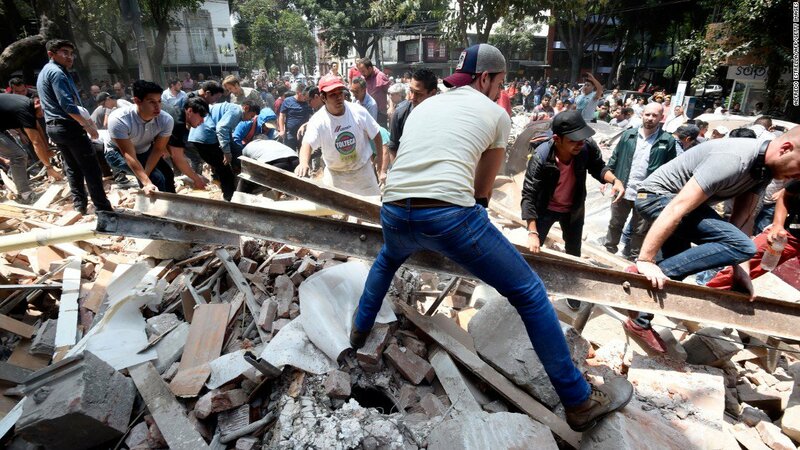 In Parque Mexico, thousands of people have congregated – many with hard hats, picks and shovels, waiting to be sent to the rescue somewhere in the city. But without a centralized relief effort and varying reports of fallen buildings, people wait helplessly. Every 15-20 minutes, sirens go blaring past us. A small tortilleria has set up a few power strips in front of their store offering a free charge and a sign that reads, llame a su familia. Call your family. A group of volunteers link hands and pray. It is announced on several social media outlets that there are *too many* volunteers on the streets which is making it difficult for professional relief teams to do their jobs. Ray and I stand in Parque Mexico and feel helpless. You don’t want to stay home and do nothing, but you don’t want to be in the way either. We resolve to return home and think of a more innovative way to be helpful. As the days pass, people come up with creative ways to help. I see a choir singing at the base of fallen apartment building to encourage the relief workers. Florist are donating flowers and creating memorials. Psychologists and mental health professionals are offering their services on the streets. Architects and structural engineers are donating their time to examine buildings and assess damage. The metro runs free of charge for weeks to come. Ray and I begin to raise money from the states, and we send building materials to smaller pueblos in the state of Morelos that are receiving less support. It’s September 26th, 2017. Exactly one week has passed. People are somber. Everyone seems to sit silently on the metro, heads down in reflection. As I walk through my favorite local market, nobody is shouting at me to buy products. The Mexican spirit is down. Any rumble of the metro in our apartment makes me stop in my tracks and I listen. There is an “evacuation bag” hanging on the coat rack by the door. Sitting in my Sacramento apartment one year later, I think back to that fateful day. 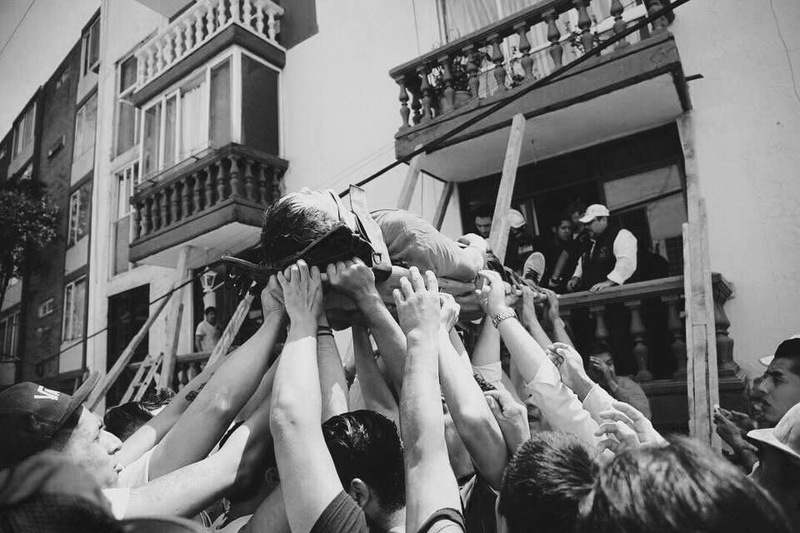 I still vividly remember the terror of living through the earthquake itself, but what comes back to me more often is the day I saw the true spirit of the Mexican people. The resilience. The selflessness. The resourcefulness. The benevolence. The solidarity. Through disaster I saw the most beautiful faces of humanity.